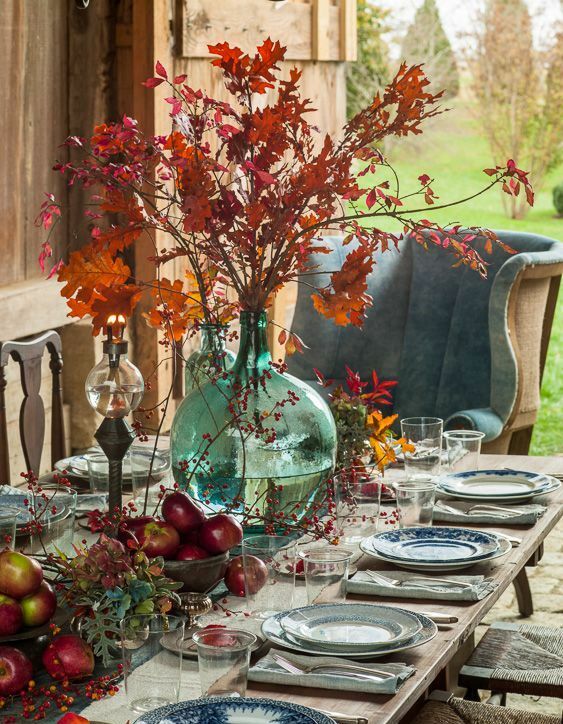 Fall is almost here, and we are already feeling its breath. 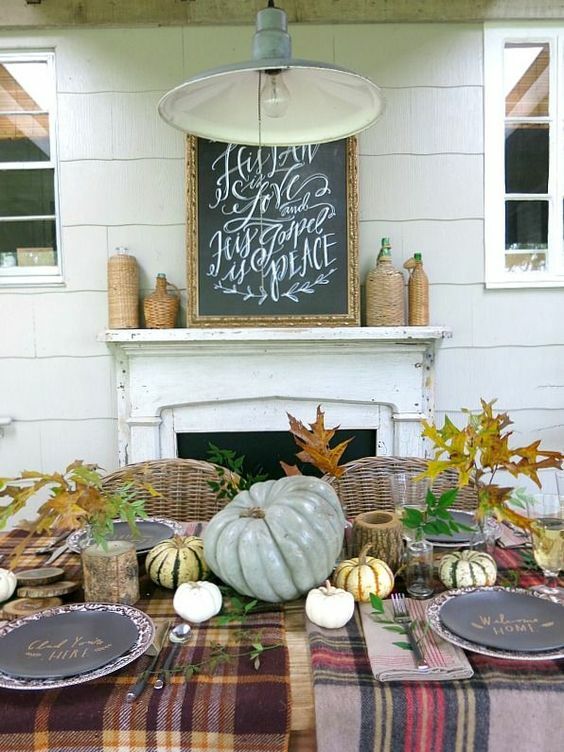 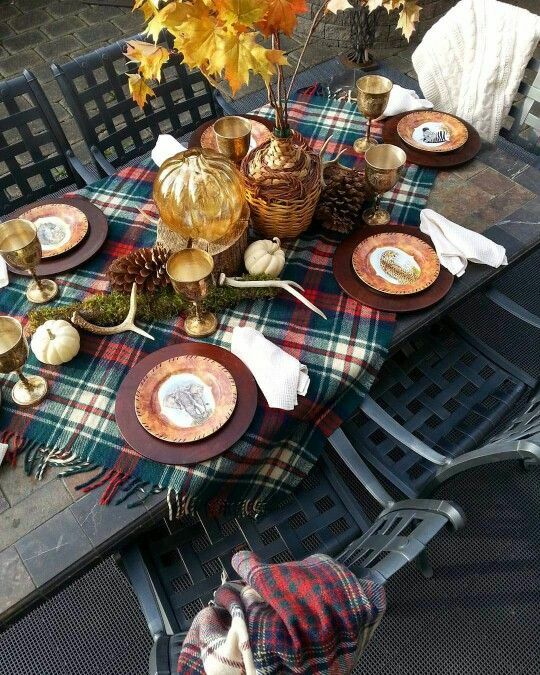 We are preparing for fall parties, for Thanksgiving and just cozy family feasts outside and inside your home. 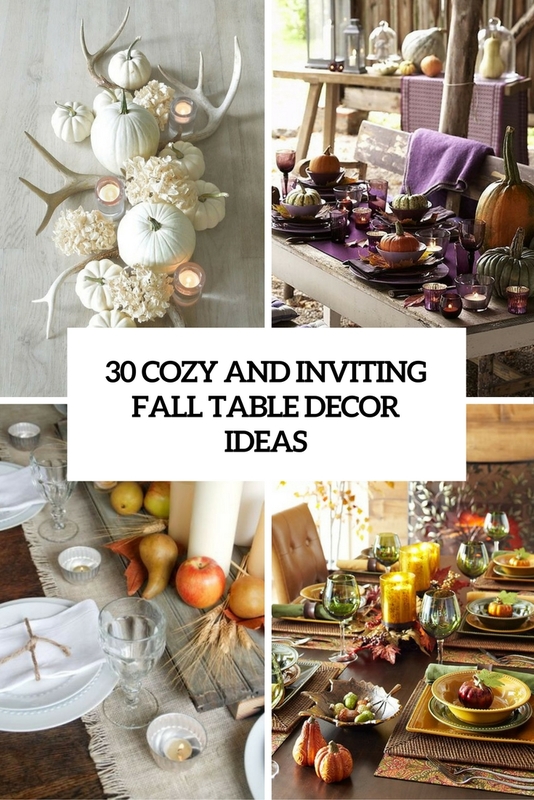 A cozy table setting is the first thing you need here, and I’ve prepared a whole bunch of ideas. 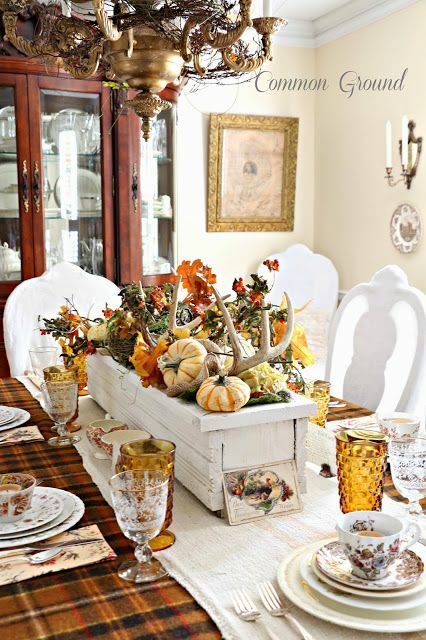 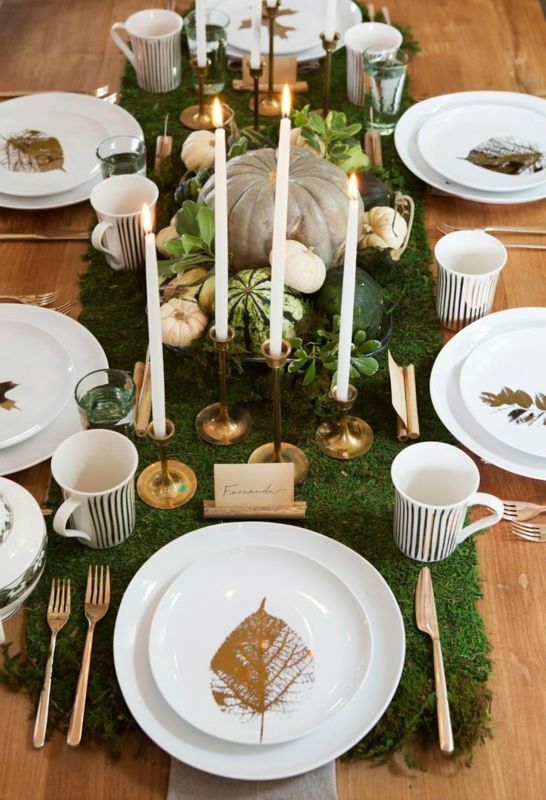 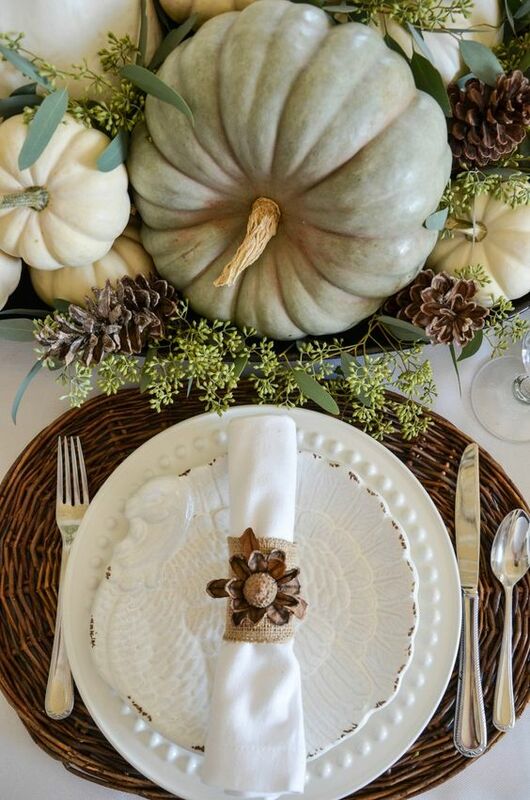 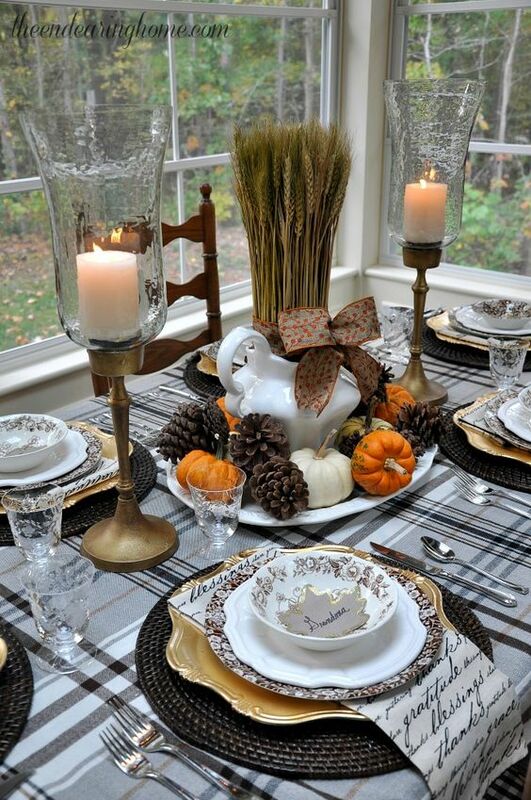 Fall table settings are often whimsy, cozy and very inviting. 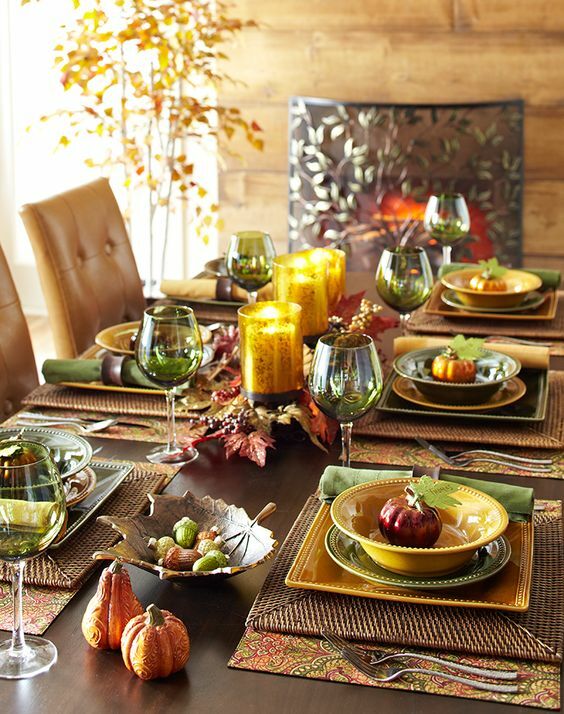 Use warm colors of fall: ocher, chocolate brown, all shades of green, black, white, cream, yellow and burgundy. 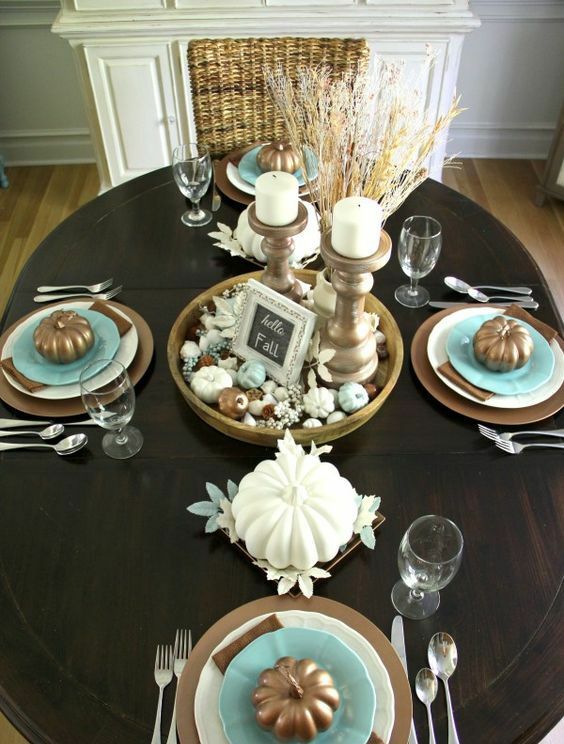 Have a look at elegant combos like cognac or chocolate brown and blue or green and gold. 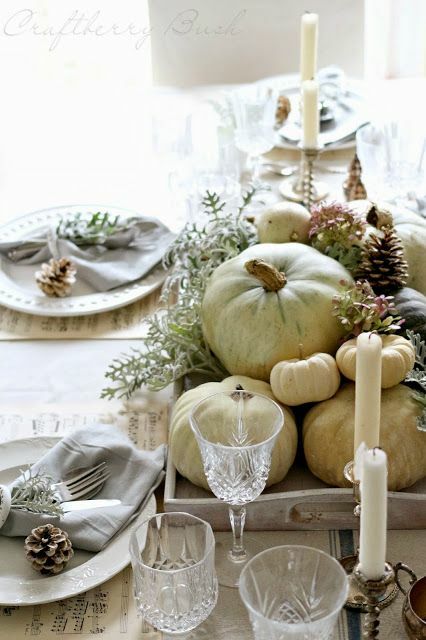 You can also create a comfy natural white and ivory tablescape adding vintage silver or gold touches. 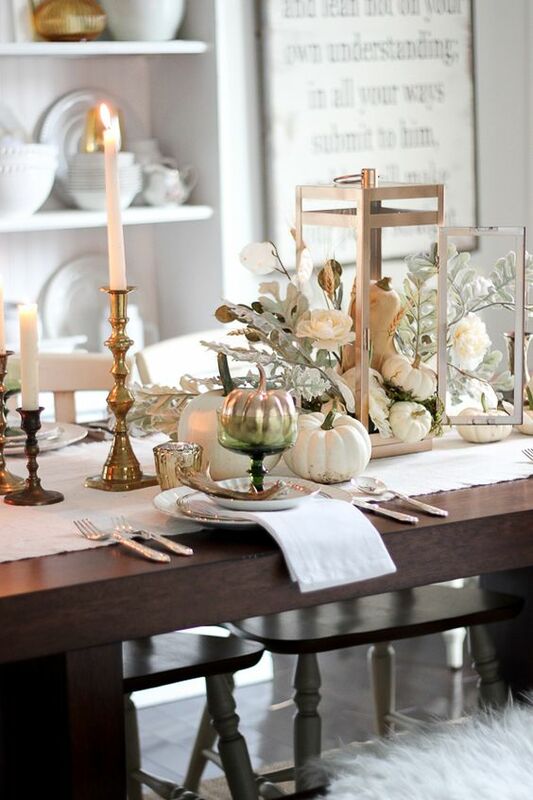 Brown is a super popular color for fall, so you can rock it in various combos with white, ivory and shades of green, it’ll look rustic and comfy. 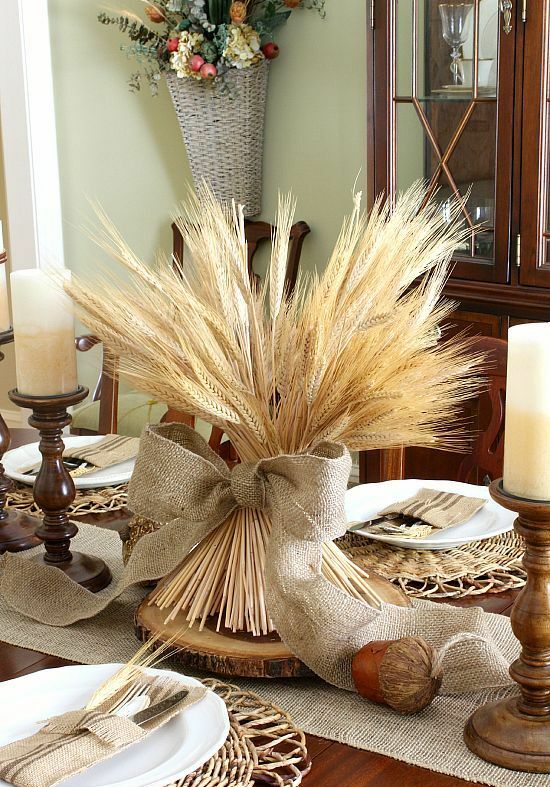 Fall centerpieces can be easily made of wheat with a burlap bow or wheat placed into a vintage vase or kettle. 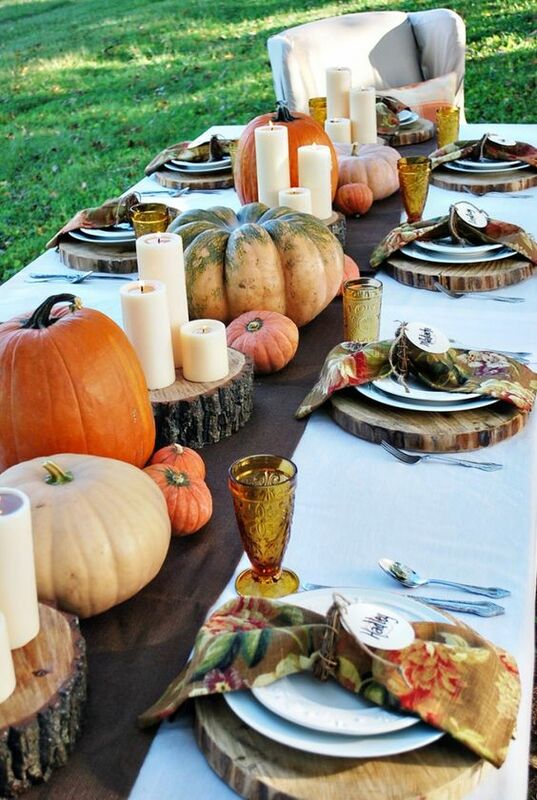 Pumpkins are perfect centerpieces, you may use them as centerpieces or table runners. 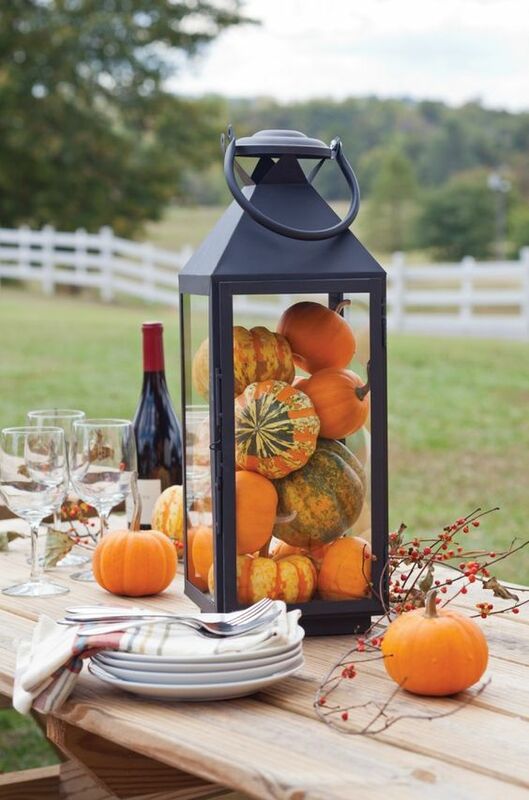 Place your pumpkins on a wooden tray, into a bowl, bucket, wooden box, lantern on take several and place them on a stand. 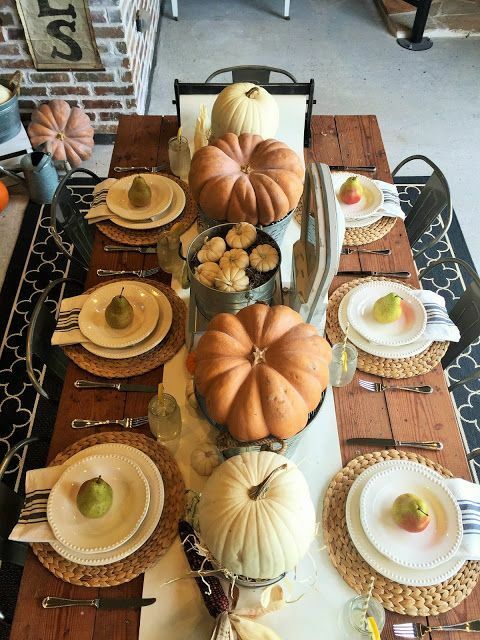 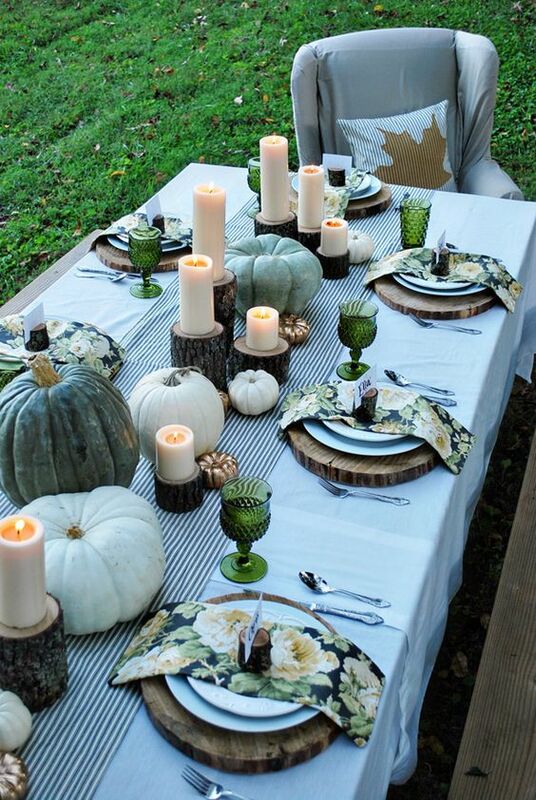 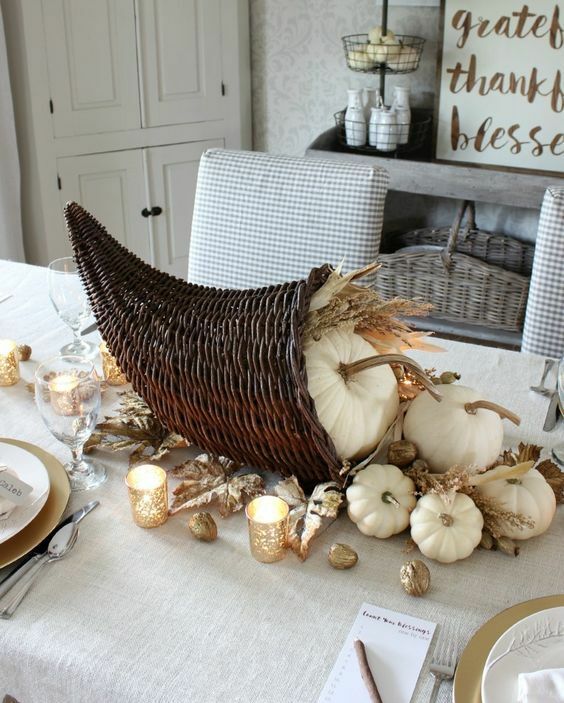 You can also place a fabric table runner and put some large pumpkins on them as a table runner. 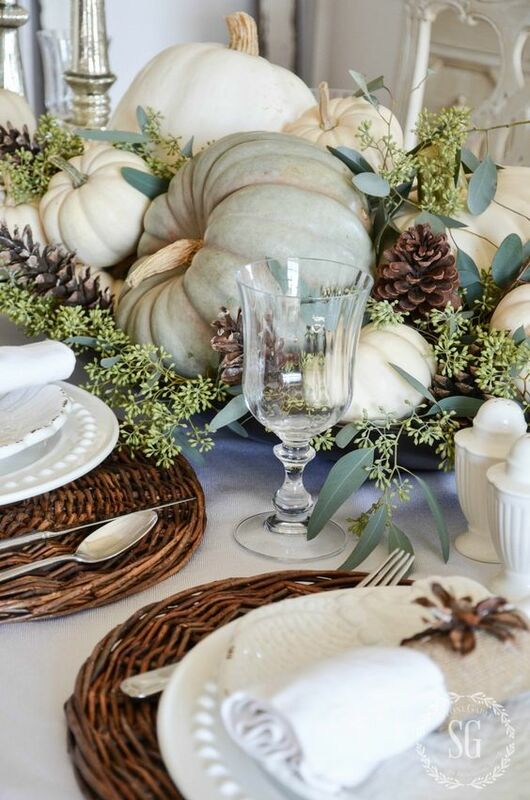 Pumpkins blend well with large pinecones, greenery, wheat and other fall items. 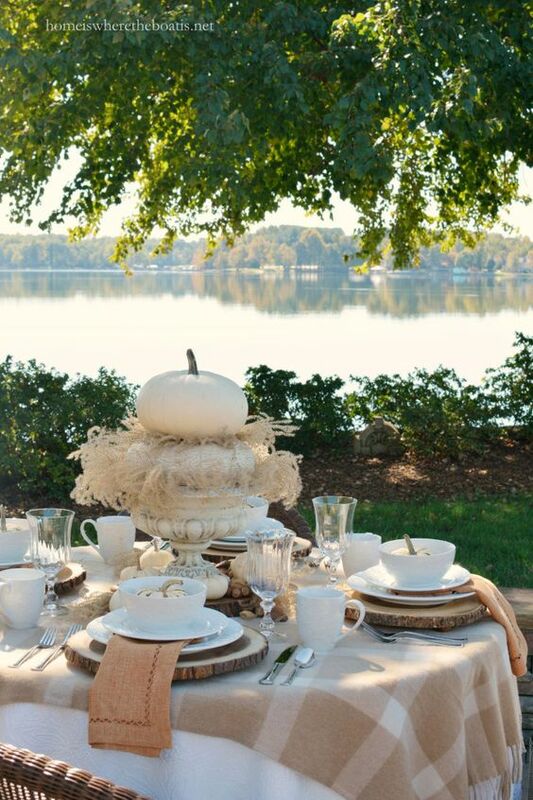 A cornutopia is a traditional centerpiece that looks awesome, fill it with leaves, pumpkins and other veggies. 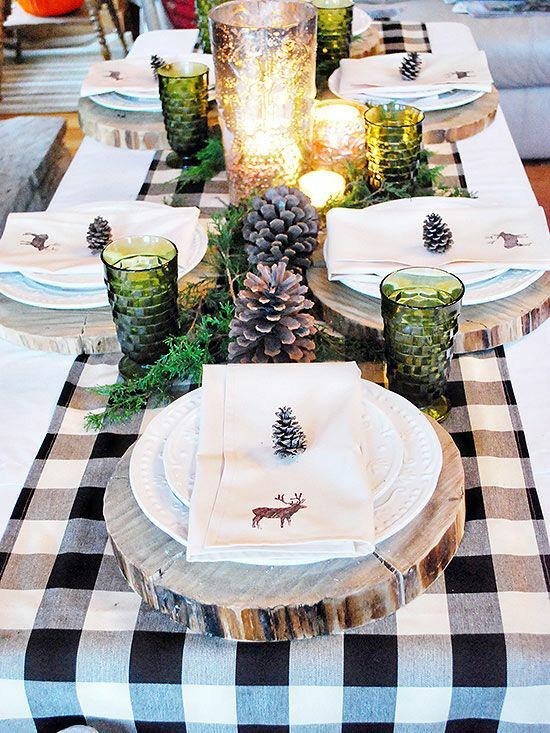 If you want to add a rustic feel, tablecloths and table runners can be made of burlap of some plaid fabric. 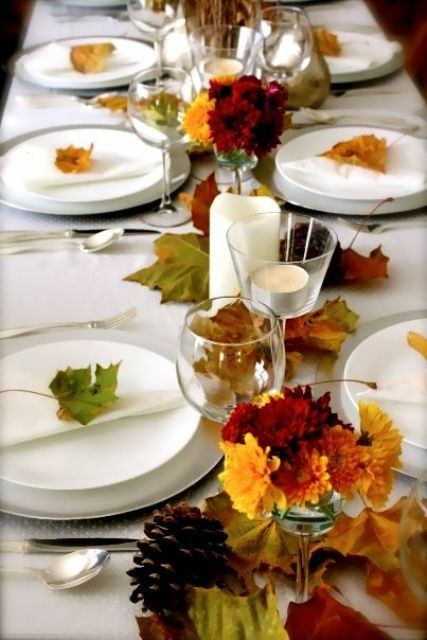 An elegant white tablecloth with or without is suitable for any case and any occasion. 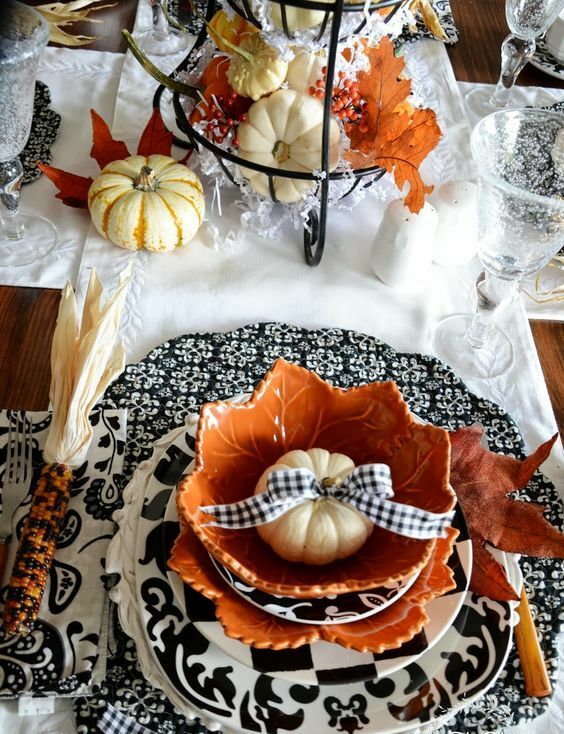 As for napkins and placemats, choose some cool patterned ones or even make them in green, brown, plaid or burgundy, make an accent with bold napkins. 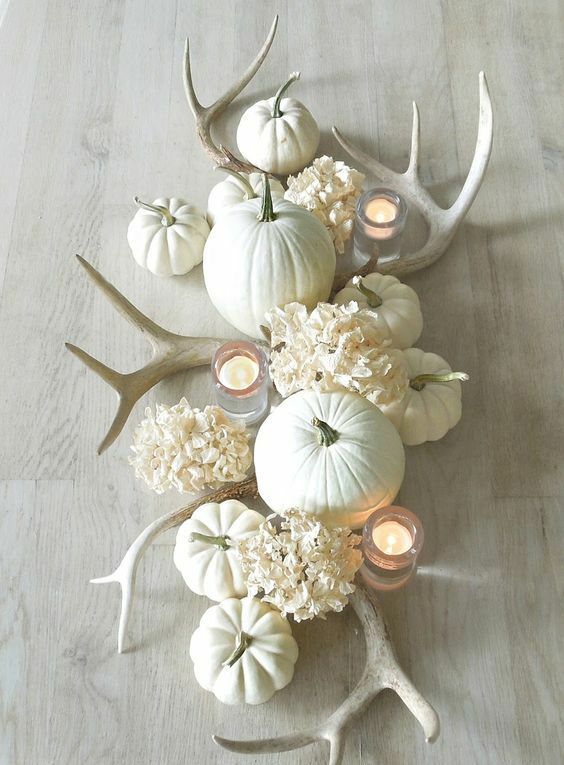 Fall is a very creative season when all the gifts of nature can be used for décor. 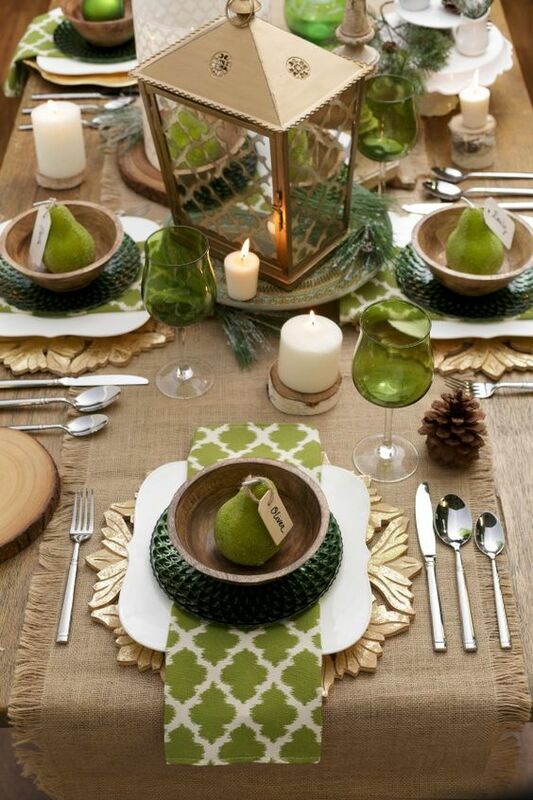 You can make wood slice stands and placemats, woven chargers for a rustic look. 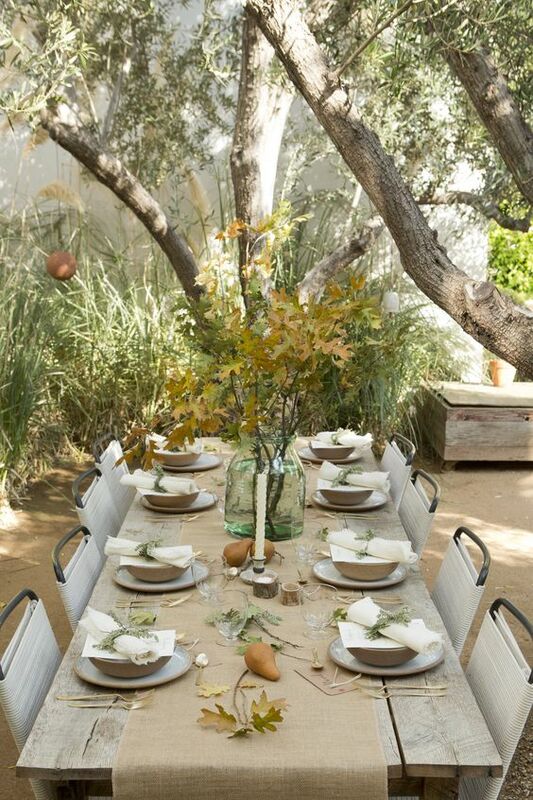 Gold chargers match elegant tablescapes and rattan ones fit almost any table setting, from a modern to a traditional one. 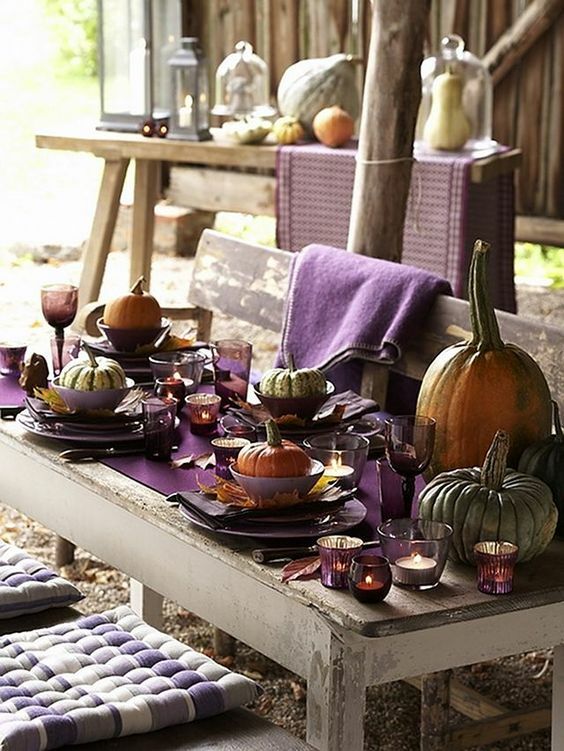 Candles are great for fall table settings, they make your table cozy and even add some warmth to it. 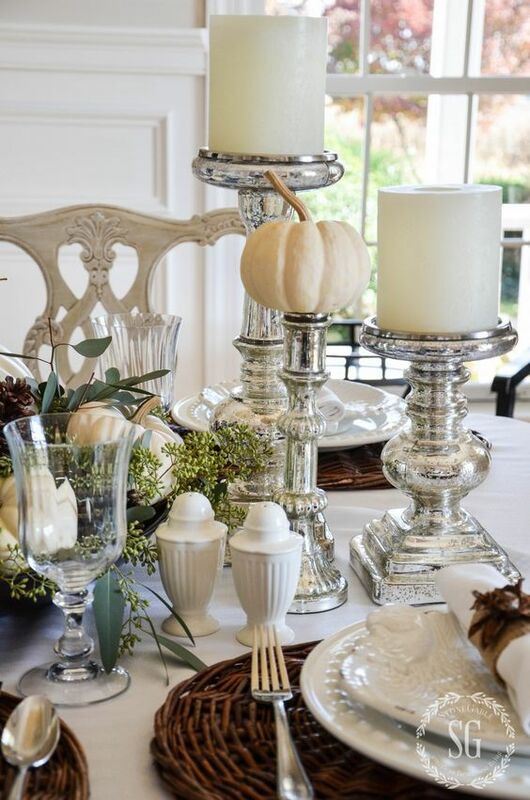 Candle holders in various styles will help to highlight your style: vintage, shabby chic, rustic, modern or any other. 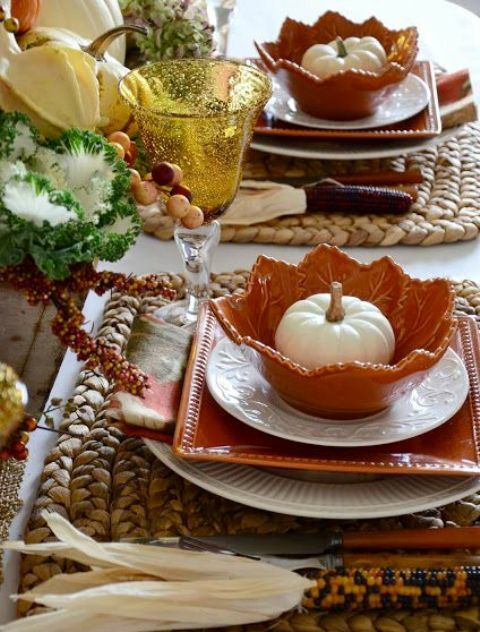 Fall leaves are an indispensable part of any fall table setting, buy faux ones or take some real from outside. 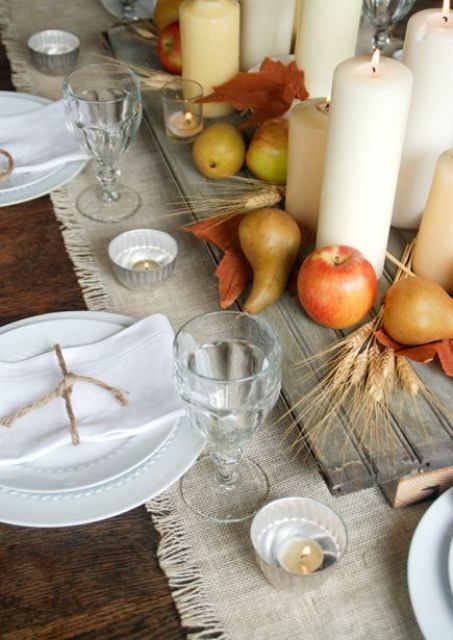 Fruits and vegetables can be widely used in fall table décor: place them on table runner here and there, place them on every plate and you can even turn them into card holders. 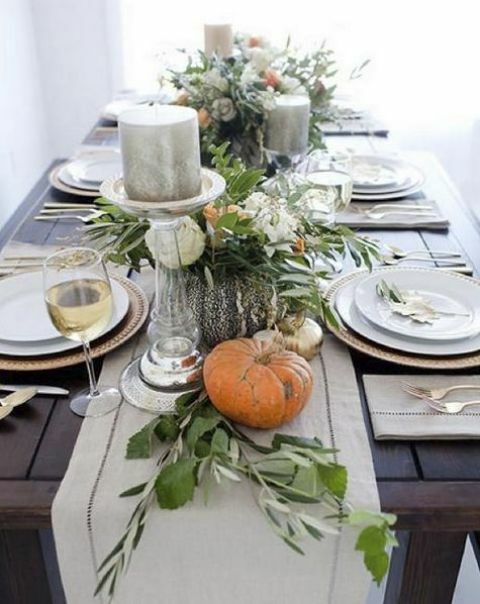 This way your tablescape will get a simple and natural look.